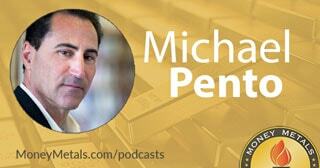 Coming up Michael Pento of Pento Portfolio Strategies joins me for an encore interview. Michael weighs in on how he sees Fed policy decisions playing out and why he believes it will have damaging long-term effects on the economy. Plus, learn why he’s been blackballed by CNBC and others in the mainstream financial media. So, make sure you stick around for a replay of our explosive conversation with Michael Pento, coming up after this week’s market update. On this final Market Wrap Podcast of 2018, we’ll look back at the year that was in precious metals markets… and look ahead to how things might shape up for 2019. We are certainly seeing some encouraging signs for precious metals investors in these final few trading days of December. Equity markets got hit by some wild gyrations around Christmas, with the Dow Jones Industrials finally gaining some footing on Wednesday and surging by 1,000 points. It appears the Plunge Protection Team is out in full force following last weekend’s urgent calls to top bankers by Treasury Secretary Steven Mnuchin. This week’s recovery in stocks could have easily sent gold and silver prices retreating. Instead, the precious metals continued to move higher. Gold closed Thursday at a 6-month high. As of this Friday recording, the yellow metal trades at $1,279 an ounce, up 1.8% for the Christmas week. And fittingly enough, silver bells rung in a big week for the white metal. The day after Christmas, silver prices finally cleared the $15.00 level. A weekly close above that stubborn resistance would bode well for silver’s near term prospects. It could get off to a hot start in 2019, as it has in each of the past few years. Silver prices currently come in at $15.34 per ounce and are posting a weekly advance of 4.6%. Despite some year-end bullish momentum building, the silver market will still finish 2018 down by close to 10% for the year. Gold will close out 2018 with a yearly loss of only about 2%. This year’s standout precious metal is palladium. It is putting in a year to date gain of about 20%! More importantly, palladium broke out to a new all-time record high and achieved the rare feats of exceeding the prices of both gold as well as its sister metal, platinum. The palladium market is showing no signs of hitting the skids just yet. Prices for the automotive metal are up 4.1% this week to $1,277 an ounce. Turning to platinum, prices are little changed for the week at $793 per ounce. For the year, platinum is headed for a loss of close to 15%, it just can’t seem to catch a break, even as the other metals have performed well here over these last few weeks. Contrarian-minded investors may be attracted to platinum as a possible comeback story for 2019. However, they may also need to exercise patience. It could take several more months before industrial users of platinum group metals begin switching in a big way from pricier palladium to cheaper platinum for use in catalytic converters in automobiles. As for what might catalyze gold and silver prices in 2019, the biggest catalyst – no surprise – could be the Federal Reserve reversing course on monetary policy. At its December meeting, the Fed pointed toward two more hikes in 2019. However, the market’s sharply negative reaction heading into Christmas is likely to foreshorten the central bank’s rate hiking campaign. Interest rate futures are now pricing in a good chance that the Fed is already finished. Just a couple months ago, analysts were saying the Fed had room to hike three or four times in 2019. Hardly anyone expected a big stock market plunge before the end of the year. One of the only analysts we know of who accurately called the stock market selloff that began in October and got worse in December was our friend Greg Weldon. He appeared on this very podcast in late October to warn investors of more volatility ahead. Greg Weldon (Oct 26, 2018): We said at the end of August if the Fed moves in September you’d see a selloff in October. That’s exactly what’s happened, and I think it’s just beginning. I think you have much more volatility. This is nothing. The on-balance volume indicators, everything. You haven’t had any liquidation and that’s a dangerous accident waiting to happen, when if you go to sell somebody’s high priced stocks that have huge ownership and a diminished turnover in shares because the price is so high, you have a potential vacuum of buyers under this market. So I don’t think you’ve seen the worst of it by any stretch of imagination. Congratulations to Greg Weldon for one of the best calls of 2018. He won’t necessarily get the recognition he deserves from CNBC or the Wall Street Journal. But we are proud to feature guest experts like him who are ignored – or even blacklisted – in the controlled New York financial media. Today’s guest Michael Pento – a man who has been banned outright from networks like CNBC – will shed some light on why he believes contrarian voices are shut out later in today’s podcast. We believe investors who expose themselves to alternative opinions are better positioned to make well-informed decisions. Those who rely solely on the same conventional sources as everyone else won’t ever gain an edge on the markets. Well, with market volatility elevated, the yield curve close to inverting, and the government partially shut down, Fed chair Jerome Powell may not want to risk triggering additional tumult in January. If the Fed folds on rates, that would invite selling in the U.S. Dollar Index – which in turn would help fuel a strong 2019 in metals. We will soon find out how things will play out in what is likely to be a very interesting year in the markets. Well now, without further delay, let’s get to our recent interview with one of our very favorite guest experts. The website is and again, it’s PentoPort.com, and my email address here is [email protected], or you can call the office 732-772-9500.